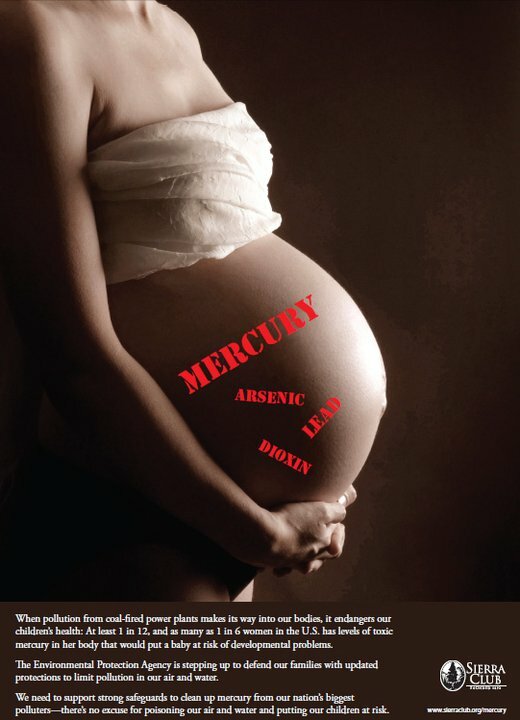 When pollution from coal-fired power plants makes its way into our bodies, it endangers out children’s health; At least 1 in 12, and as many as 1 in 6 women in the U.S. has levels of toxic mercury in her body that would put a baby at risk of developmental problems. The Environmental Protection Agency is stepping up to defend our families whith updated protections to limit pollution in our air and water. We need to support strong safeguards to clean up mercury from our nations biggest polluters – there’s no excuse for poisoning our air and water and putting our children at risk. I was excited to see the above image in the Sierra Club’s Facebook news feed as a newspaper advertisement they ran last week because it conveys a message that I have been thinking about for a long time. I have been made an argument to conservatives the Republican Party platform contains a glaring contradiction. They are against tighter controls on air pollution, but believe that a fetus has the same (or more) rights than a baby, child, adolescent or adult – especially and adult woman. A developing fetus is more sensitive to toxins than a child or adult, so shouldn’t Republicans want to protect them with the same zeal they use when trying to limit or eliminate abortion? That they do not is maddening. I’ve gotten a few different responses to my line of reasoning. Some just scratch their heads and say “I’ve never thought of that.” Others tell me I’m being stupid, or delusional and don’t understand my point at all. I’ve heard from some pro-lifers that they, personally are also environmentalists so there is no contradiction. Another told me that an abortion will definitely kill a fetus, but pollution has a less than 100% chance of doing damage so it’s more important to focus on stopping abortion first. Apparently a woman’s desire for an abortion or for a healthy child are meaningless. But I do want to commend the Sierra Club for attempting to mainstream this argument. It’s an important one for environmentalists to make louder, clearer and more often. Most people don’t realize that as harmful as pollution is, children and fetuses are affected even more adversely because they are smaller and still developing. This issue is a great example of how feminism and environmentalism and feminism intersect. For women who want to be mothers, it is unfair that the chance to have a healthy baby can be taken away by the governments inaction on stopping industries from spewing poisons into the air. Last week, I went to Loui’s BBQ Greek Restaurant in Bayside Queens. I had noticed the new venue while driving by, and from across the street the logo and signs in the window only appear to say “LOUI’S BBQ” and so I had assumed it was a new barbecue restaurant. I had asked my husband and another couple along with this in mind. Our expectations of pulled pork, cornbread and brisket were quickly dashed when we entered the almost empty restaurant to find a menu of standard Greek cuisine. It didn’t help that they did not yet have their liquor license. Wine and beer were on the menu and the waiter told us they were in the process of getting it. We ordered salads – greek and house, both were good. I ordered the grilled chicken with wild rice. I received a very generous portion. The chicken was fine, and I loved the rice – there were small pieces of dried fruit in it, and it was delicious. I had excellent left overs. My friends ordered the pork chops, ribs and souvlaki. They said it was decent food, but nothing extra special. After dinner we ordered cappuccino and baklava. It was a very good dessert, and another large portion. However, I had to wait a few minutes after my baklava was served for my cappuccino – apparently they were still learning how to operate the new machine. The staff was friendly but the service was very slow – especially considering we were the only people in the restaurant. Perhaps they wanted to keep us sitting in the window – an empty restaurant on Bell Boulevard at dinner time is normally an impossibility, and probably not a good omen. Bottom line: Decent food, but with a misleading name.